Get Motivated With This 5 Black & White Picture Quotes - Motivate Amaze Be GREAT: The Motivation and Inspiration for Self-Improvement you need! 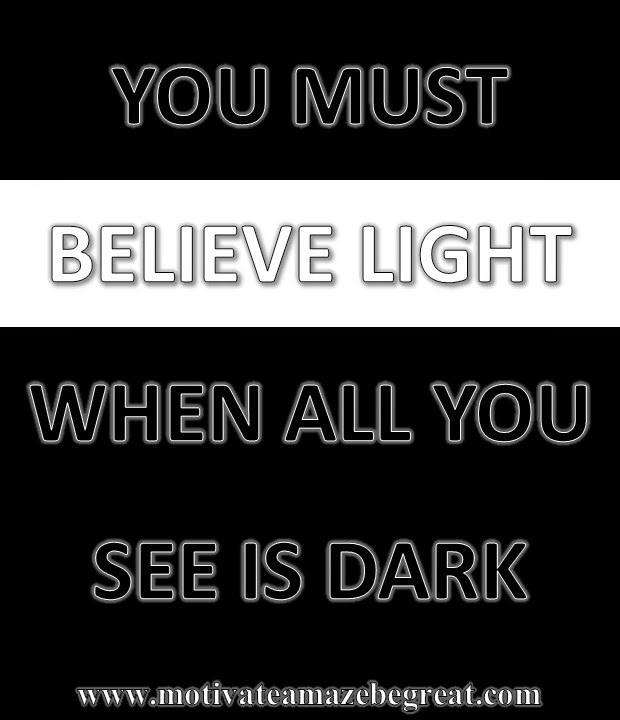 "YOU MUST BELIEVE LIGHT, WHEN ALL YOU SEE IS DARK." Our take: The sun rises every morning when all is dark, the same sun always comes after rain. But light here is figurative: same thing with your life, when you have troubles notice that they aren't permanent, solutions are just around the corner and eventually they will get solved (light). When you are down, you can get back up, and you will get up. So what's important here? When you work for what you want, you won't see results right away, you have to continue working with a believe in mind: Things will get better, although you can't see an immediate change, you have to believe results will come, although you don't see any of them. You must have faith and believe in the work you are doing. You are heading the right way, but that doesn't mean you have arrived to your destination, you will get there, but you must keep walking and believe in the progress you are making. 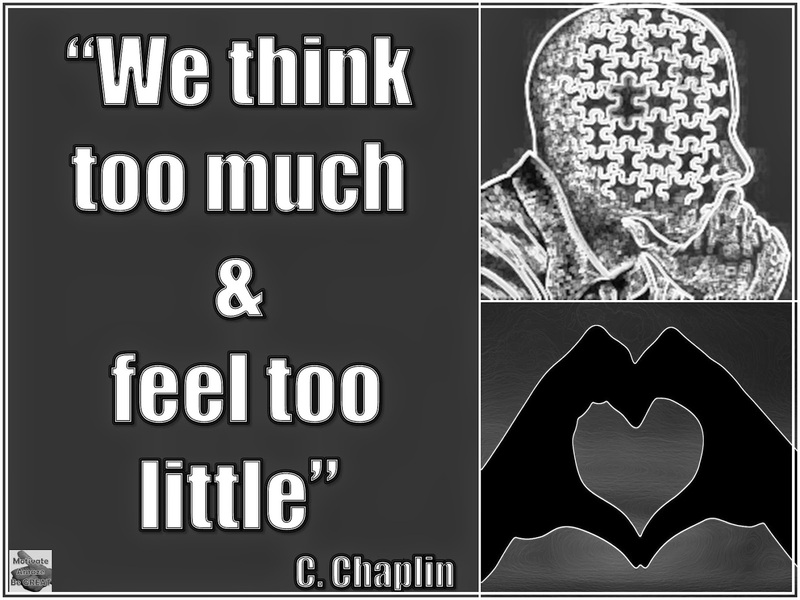 Our take: For us this is a fact in modern society, the curious thing about is that this is a quote from Charlie Chaplin in the movie The Great Dictator from 1940! And it's still accurate to what's going on in today's society! Mainly because mankind continued the technological evolution, but did we made progress in human qualities field? Qualities about human character, like kindness, love, respect, honesty and integrity? Are we getting clever, but loveless. Are our thoughts guiding our daily decisions without the assistance of our hearts? Do you have space in your life for passion? Do you make space for things you love to do? Are we becoming more robots, becoming more machines, obsessed with our daily routine and tasks, are we becoming less humans, neglecting other people? That's what you should question in your own life, do something about if the answer doesn't satisfy you. Our take: In our journey to becoming better, we need to be constantly looking for things that will actually makes us better, we look for self-improvement and inner growth by reading a book, by watching a rich documentary, by having a great conversation with wise people, by studying life examples, etc. 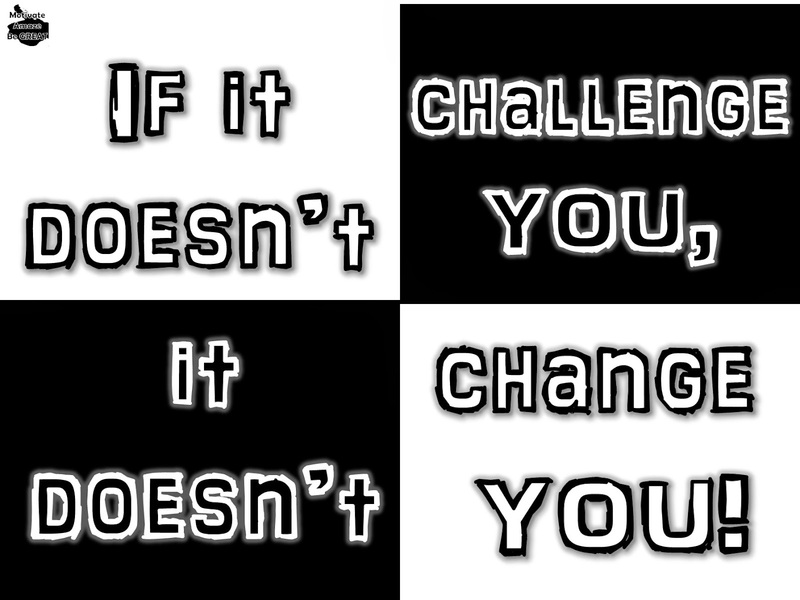 Whatever the case might be, one thing must be common, in any of this forms of self-development, for you to grow - Things must challenge you! They must be different in some way than what you previously know, they must add something unknown for you to become different, they must push you to new boundaries, push you to the limit. After being pushed to limit a new limit is reached, a new boundary is achieved, you become more knowledgeable, you become better. This is also an important factor when it comes to being motivated to perform tasks, when you feel that you are being challenged you work with other pace, you move and feel in a special way, you are driven to perform better. So if you want to become better, if you want to change, you definitely need to look for things that represent a challenge, not things that are already known and don't represent nothing new. Our take: you can have a job that you don't like, you can get all the money in the world with a get rich quick scheme, you can lie to people and get away with it, but in the end, you will feel miserable with yourself. Why does this happens? Because love is the number one driving force in our lives, whether you use or not, loves is always there. So if you do things with others things in mind, neglecting love, you won't get fully satisfied never, because love is nowhere near of being part of your life equation. But if you act otherwise, with love has your main guidance, things get on the right track, happiness and fulfillment are up for grabs. 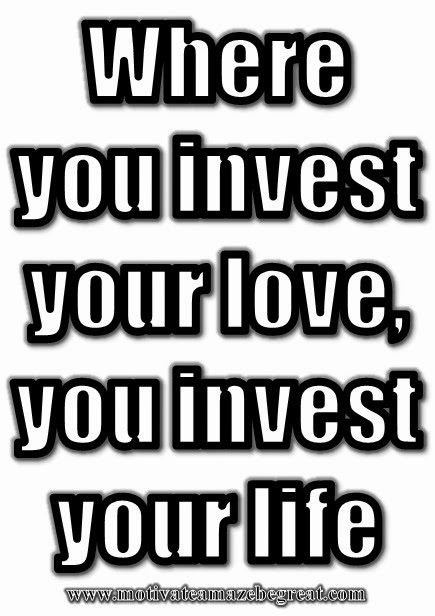 So, this is what you can conclude, if you invest in love you investing in your life, if you don't invest in love in are not investing in your life. 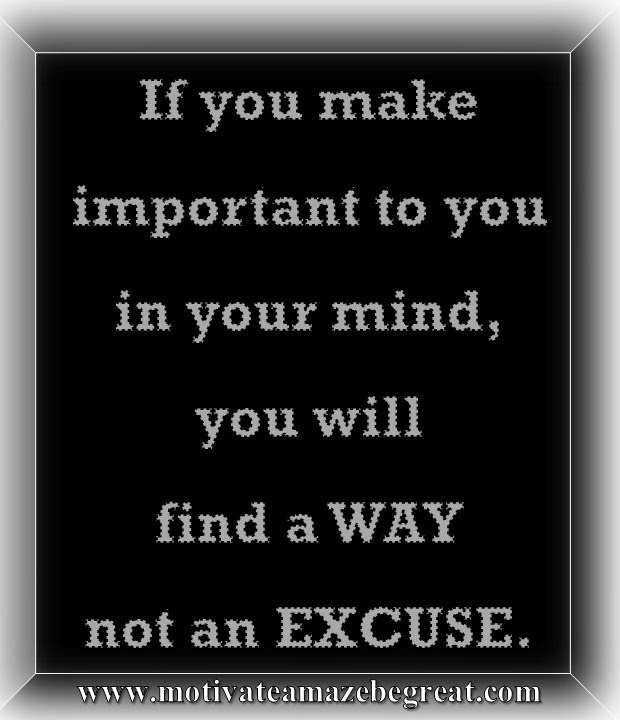 "IF YOU MAKE IT IMPORTANT TO YOU IN YOUR MIND, YOU WILL FIND A WAY NOT AN EXCUSE." Our take: Priorities are the fuel of life. You need to get your priorities in order so your tank is always full so you can move from place to place. So in a figurative sense, you will find the way to go in the road map of life, because you have the ability to move to where you want to go. Excuses are like empty gas tanks, you get too lazy to fuel your tank, so you can't move to anywhere, but you blame something else. We do this, sometimes, because not moving gets us that comfortable feeling. and we don't like to blame ourselves.